Light streaming into St Peter’s Basillica, Vatican City, Rome, Italy. Photo by Jeb. 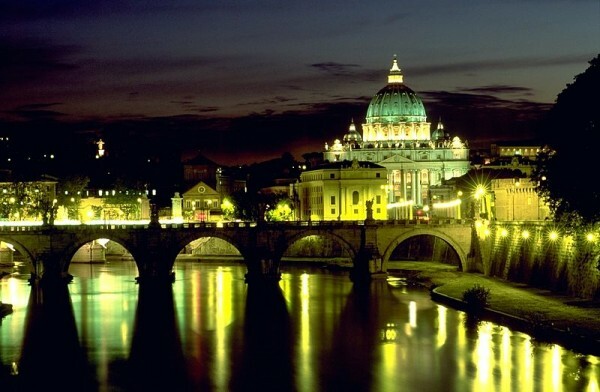 The Vatican City is 0.17 square miles of gilded glory tucked inside Rome, Italy. It’s 0.53 miles by 0.65 miles. How small is that, you ask? Let’s put this in perspective. To walk across the country is like taking two laps around a standard jogging track. Which is why there’s no country smaller. And yet, Elizabeth Gilbert said that, if a country could be summed up in one word, the Vatican’s word would be power. 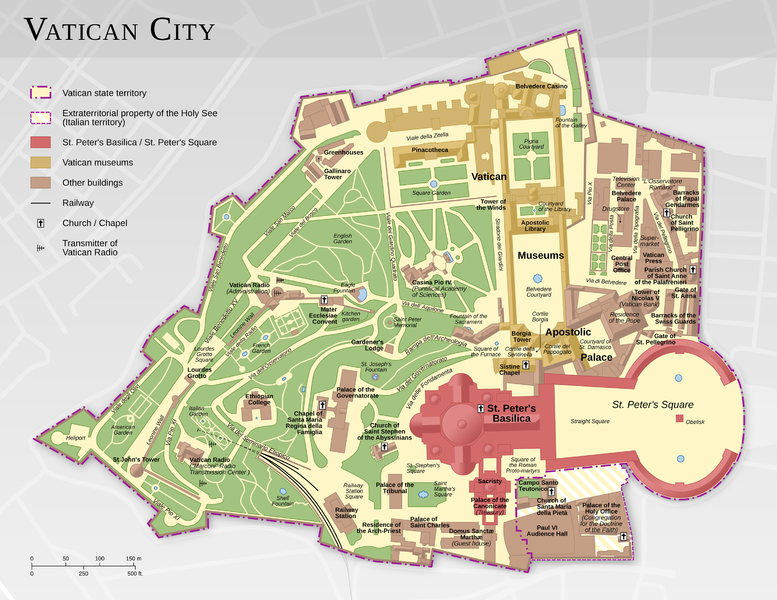 Map of the Vatican City designed by Francesco PIRANEO G.
So who exactly is a citizen of Vatican City? Peek over her walls, all you’ll find only one restaurant in the Vatican City. I have to admit I love Andrew Zimmern’s bold idea to triple this number. It amazes me on many levels that Italy has not one, but two countries nestled inside her borders. San Marino was delicious, but somehow starting out this week in the Vatican City feels more… concentrated. Angels Bridge and Basilica di San Pietro. Photo by Andreas Tille. 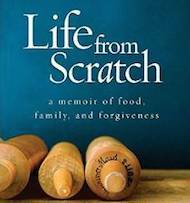 When I asked you all what dishes you recommended we try, several suggested the Eucharist, which is fine for a Sunday, but not quite the I-can-cook-this-at-home sort of recipe I was looking for. At the end of the day, the best thing seemed to look for Roman recipes. After all, Vatican City is inside of Rome. Turns out this area is known for amazing, thin crust pizza, peppery spaghetti alla carbonara (which got it’s name from being so covered with pepper, it looked like coal), good old fashioned meat sauce [Recipe], and spaghetti all ajo e ojo (which is little more than oil, garlic, and hot chili pepper). All this was fine, well, and good. But not exactly what I was looking for. Then I figured out the key. 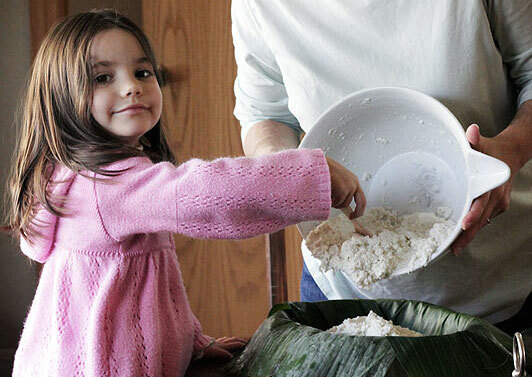 I had to find out if any of the recipes were adapted for the pope. Turns out there was. Spaghetti alla cabonara became linguine alla papalina [Recipe] in the late 1930’s. More on that in the days to come. 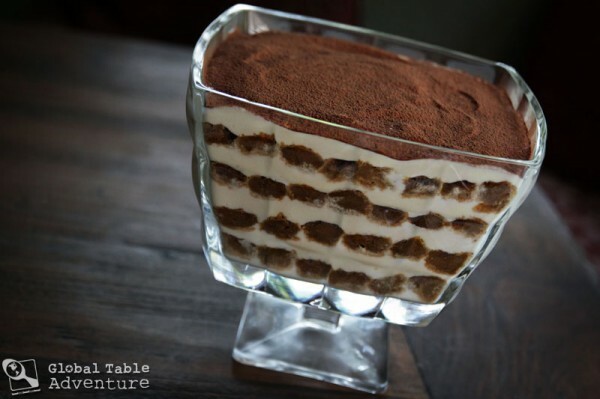 Until then, have a bit of Tiramisu or a slice of ricotta cake. I see it as a brilliant deflection of the journalist’s inevitable, inappropriate question… which he never got to pose (thankfully). I agree – it is a stunning photo… so much wonder. Today is the Feast Day of St Therese of Lisieux (born to Louis & Zellie Martin) of the child Jesus – the Little Flower . Designated a Doctor of the Church. Died of TB at 24 and promised to send a shower of roses…”What matters in life is not great deeds but great love” I think this blog has been a great deed and an on-going witness to great love….congratulations on a job well done. The 1st photo is wonderful. 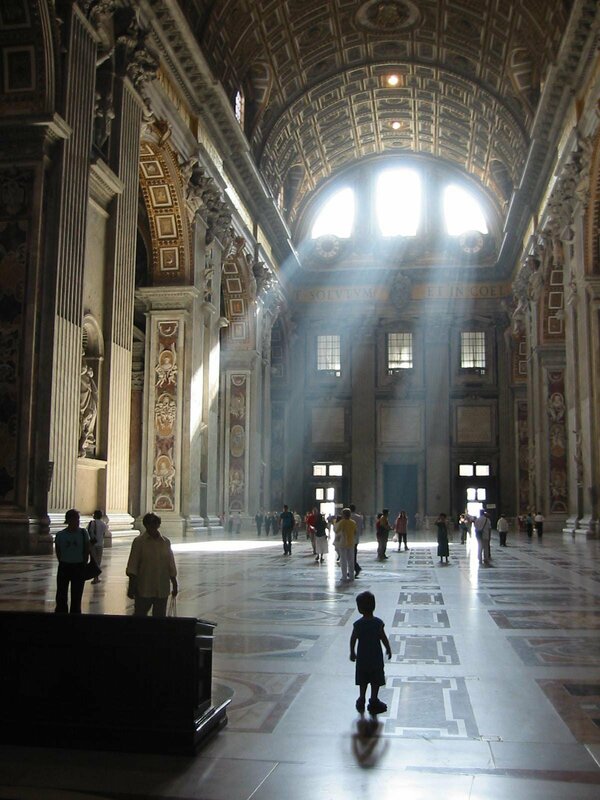 The light coming in from the clerestory windows in St. Peters Basilica is amazing. I’ve been there too and remember the quality of the afternoon light light falling on the frescos and the marble floors. Something you never forget. Spaghetti Carbonata is one of my favorites looking forward to your recipe. The Vatican may only have one restaurant, but it does have some pretty terrible museum cafeterias as well. (Museum cafeterias, by the way, are very unusual in Italy so it’s unsurprising that they’re not well done.) 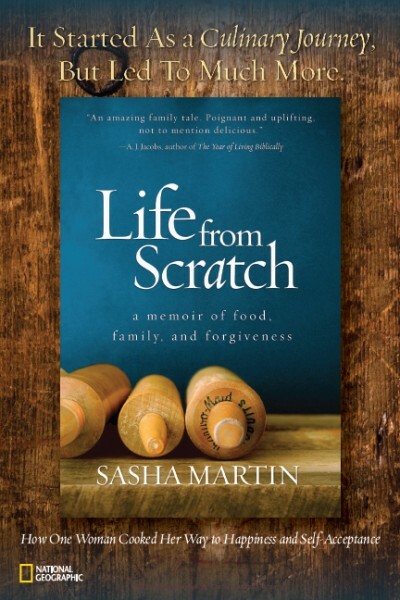 My memory of Vatican food involves some truly terrible pizza, a Nutella-branded crepe stand that did not even make the crepes fresh, and an overwhelming wish that I’d snuck more rolls from the hotel breakfast into my pockets, or stopped at a convenience store for food the night before. The Vatican is independent thanks to the efforts of Renaissance popes. They made the Papal States one of the biggest and most powerful countries in the region that is now Italy. There was a reason. In 1524 or so, when the Papal States weren’t very big, King Charles of Spain sent his army into the Vatican and made the pope do whatever the King wanted. Which is why England became Protestant. Henry VIII’s wife was related to King Charles so the Pope didn’t dare allow a divorce. divorce between who and who? Divorce between Henry VIII and his then wife. She couldn’t bear children and he wanted an heir. The Pope refused because divorce is not acceptable in the Catholic Church. In retaliation, Henry created the Church of England and forced all the people in his court to swear to it. Thomas More refused, was beheaded. He is recognized as a saint for his bravery. Am I getting it right? not sure…I do know that Thomas More is the patron saint of Politicians. Boy…I’d like to see a modern day politician stand up for what he believes and risk getting his head cut off…Ha!